Turquoise seas, thriving ecosystems, sprawling deserts, and uninhabited beaches. If this draws you in, then Southern Baja California is your match. A land of contrasts, the southern tip of the Baja Peninsula rewards visitors with remarkable natural settings and all inclusive oceanside resorts; crumbling missions as well as world class restaurants and a thriving nightlife, making it a destination for travelers of all tastes. One of the best ways to experience this slice of paradise is on a self-guided road trip through the region’s most picturesque locations. With ridiculously affordable car rentals (about $30USD/week) and relatively short drive times, Baja California Sur is the ideal place to hit the pavement and explore a la rubber-tramp. This region’s top destinations include La Paz, Todos Santos, Cabo San Lucas, and Cabo Pulmo National Park, and can be visited comfortably in 10 - 15 days depending on how leisurely you like to travel. Check out our recommended places to stay, top activities, as well as the best spots to eat, drink and party in each destination. Dive right into your adventure by flying to the first destination on our road trip: Cabo San Lucas. With an international airport, car rental, and a long list of unmissable experiences, this coastal town is the perfect place to kick off your journey. Cabo San Lucas sits perched at the south end of the Baja California Peninsula and, together with San José del Cabo, makes part of the world famous “Los Cabos”. The Los Cabos region is a unique blend of desert landscapes, beaches, and mountainous regions. Cabo San Lucas is located right where the calm, sapphire Sea of Cortez and the rough, indigo Pacific Ocean meet, and has something to offer for everyone - whether you want to sunbathe and relax on a beach, bungee jump over desert canyons, kayak and snorkel with sea lions, scuba dive in some of the best sites in the Pacific, or party all night. Expect to toss your inhibitions to the wind - and let yourself have fun! Cabo San Lucas is a place to enjoy, both during the days and at nights! 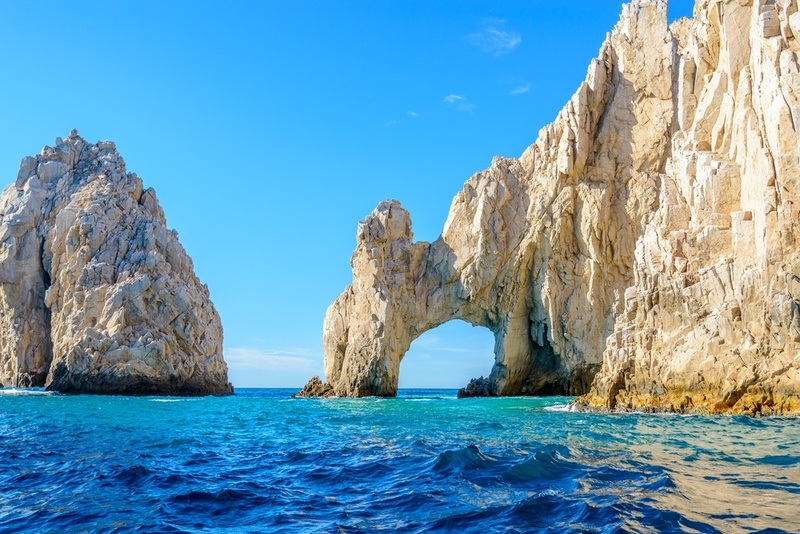 The Arch, also known as Land’s End, is a stunning and iconic rock formation that erupts out of the sea at the tip of the Baja Peninsula. It is located just in the spot where the Pacific Ocean meets the Sea of Cortez, and is a popular attraction that can easily be reached by private boat tours, water taxis (available in Cabo San Lucas harbour), kayaks, and stand-up paddleboards. You can view the golden rock arch from the boat or you can ask the captain to drop you off for a swim and pick you up later. On the stunning rock formations, you will also be able to see a colony of sea lions basking in the sun. The wildlife in this area is incredible. It is also an excellent snorkeling and whale-watching spot. 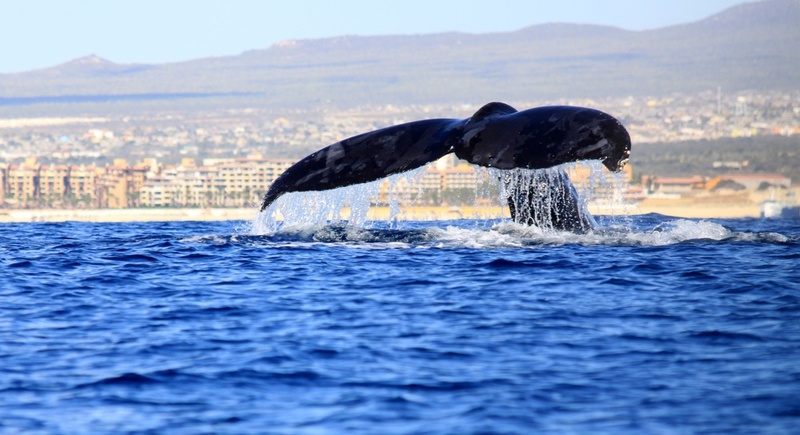 Gray Whales can be seen in the Baja waters during the months of November to April. The season can, however, start as early as October. Pelican Rock, another famous rock formation near Land’s End, is another excellent snorkeling spot that is also popular for cliff jumping. 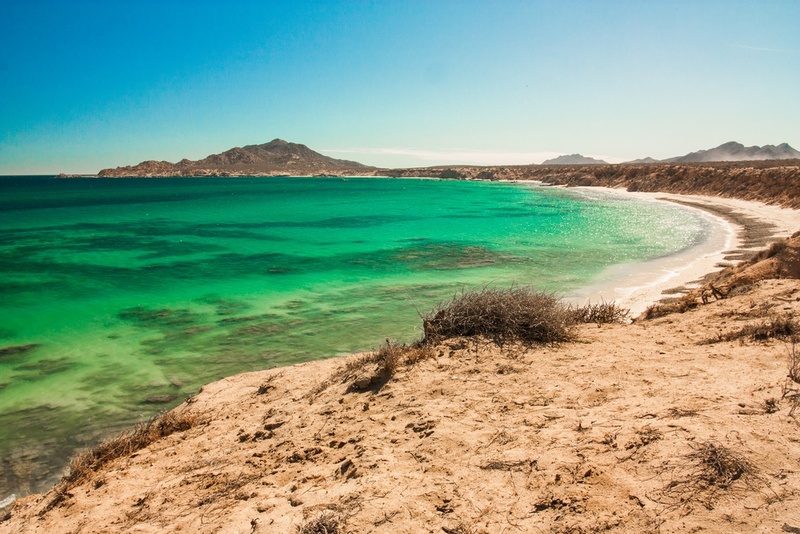 Although most beaches in Cabo are not swimmable, here you’ll find quite a few that are perfect for swimming and snorkeling when the conditions are right. Lover’s Beach/ Playa del Amor - Lover’s Beach is a clean, sandy beach, located right by Cabo’s famous rock archway, and should definitely not be missed on your trip. Nestled on the Sea of Cortez, it is calm and clear. The sand is quite soft and it is surrounded by beautiful rock formations. This beach is an excellent place for snorkelling, kayaking, jet skiing, swimming, drinking, etc. Water taxis can drop you off directly at the beach. Divorce Beach - Another must-see beach is Divorce Beach, which is close by to Lover’s beach, but contrasts it in many ways, not only in name, but also in style. It, too, has stunning rock formations and is a beautiful place with marvelous views. Water taxis can get you to a great vantage point. *This beach is located on the Pacific side, and the waves are fierce, making it more difficult to swim in. Playa Medano - This is a great sandy beach with lots of locals, vendors, restaurants, and activities. The water is clear and beautiful and it is a good place to swim and soak up the Baja sun. SUP and Kayak rentals are available, among many other activities. Chileno Beach - Chileno Beach is an excellent beach for swimming and snorkelling. It has few public facilities and infrastructure, but is very beautiful. There is an amazing variety of fish right off the shore and is a very serene beach. Play Santa Maria - This beach is lovely and, depending on the day, can either have a really calm surf or a rough one. It is a jewel of a spot with rough sand and clear waters, excellent for snorkeling. Tour boats like to stop at this beach. There is a small kiosk for drinks. Playa Las Viudas - This is a small beach compared to the others surrounding the area. It is a quiet bay, great for snorkelling, kayaking, SUP, and swimming. There are no vendors or restaurants and it is an uncrowded beach where you can get some peace and quiet. There are many rock formations that make natural tide pools that are excellent for relaxing in. 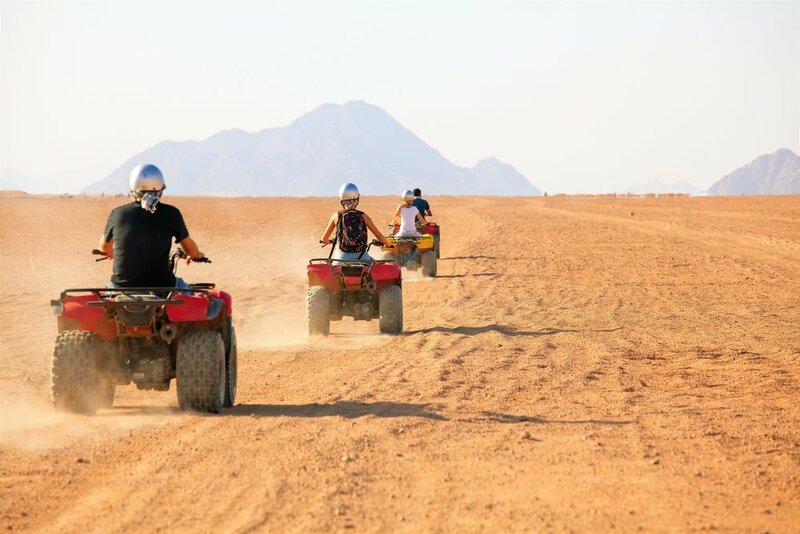 Cabo is the place for outdoor activities and adrenaline. From watersports, boat tours, and whale watching to ziplines, ATV rides, and bungee jumping, Cabo is the place to push your limits. One & Only Palmilla(ultra) - Live in the lap of luxury at Palmilla where its first-class service and lavish rooms are rivaled only by its unmatched oceanfront panoramas. A true retreat from the busy streets of Cabo San Lucas. Bahia Hotel & Beach House(mid-range) - Although Los Cabos have some of the most expensive resorts in the world, there is something for all budgets in this exciting region. The Bahia Hotel & Beach House is a beautiful boutique hotel which sits in the heart of Cabo San Lucas’ Medano Beach district, and features a chic interior, an inviting open layout, and amazing ocean views. El Farallon ($$$$) - Divine, fresh seafood at the most romantic spot imaginable. Sit on top of cliffs and watch the sun set behind the Pacific. Flora’s Field Kitchen ($$$) - Amazing farm-to-table meals located in San Jose del Cabo. A must stop for visiting foodies. El Squid Roe ($$$) - A popular Anderson’s Group bar-nightclub where you can party all night long! Located just a 2h15 drive from the bustling streets of Cabo San Lucas, you’ll find Cabo Pulmo National Park, a Marine Protected Area and UNESCO World Heritage Site. This park has been heavily protected for nearly 20 years and is the only surviving coral reef that exists in the Gulf of California. 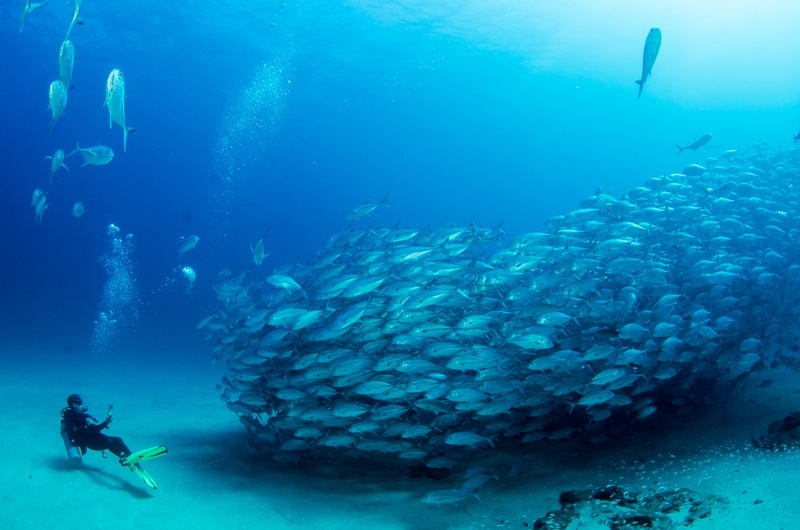 Cabo Pulmo is a success story for Mexican conservationists, and is often called an “Ocean Miracle” as, since its protection, the fish biomass has increased by at least 463 percent. Cabo Pulmo is a paradise for those who love sports and the outdoors, in particular scuba diving and snorkeling. Diving in Cabo Pulmo is an experience of a lifetime, offering a fascinating mix of stunning coral reefs with the impressive marine life of the Sea of Cortez. The water has a great visibility all year round and is quite temperate, allowing you to easily see multicolored fish, dolphins, manta rays, turtles, and whale sharks. Hop in and enjoy some of Cabo Pulmo’s most enticing water activities, including eco-tours, scuba diving, snorkeling, kiteboarding, and sport fishing (just outside the national park). Villa del Faro(luxe) - This elegant eco-hotel on Baja’s East Cape is totally off-the-grid. Villa del Faro boasts six separate “casitas” with private patios, stunning views, and authentic local adornments. Relax in seclusion and tranquility, with the comforts of top amenities at your convenience. With its laid-back, small-town charm and its fusion of old-world beauty and hip trends, La Paz is just a quick 2h45 drive from Cabo Pulmo and is probably the most authentic and ‘Mexican’ cities in all of Baja. It is a safe and welcoming city with a spectacular view of the Sea of Cortez - a sea that the world-renowned marine conservationist, Jacques Cousteau, named the largest aquarium in the world, as more than 85% of marine mammals in the Pacific and 35% of the marine mammals around the world live in these waters. La Paz is a tranquil, sun-soaked area with beautiful waters, amazing wildlife, nearby mountains, and amazing cuisine. The island of Espiritu Santo is a true gem, with shallow azure bays and light-pink cliffs. The pristine island is surrounded by beautiful and unique rock formations near the shoreline. Because it is situated within a natural reserve, there are no hotels or constructions on the island and all tourism is very regulated. 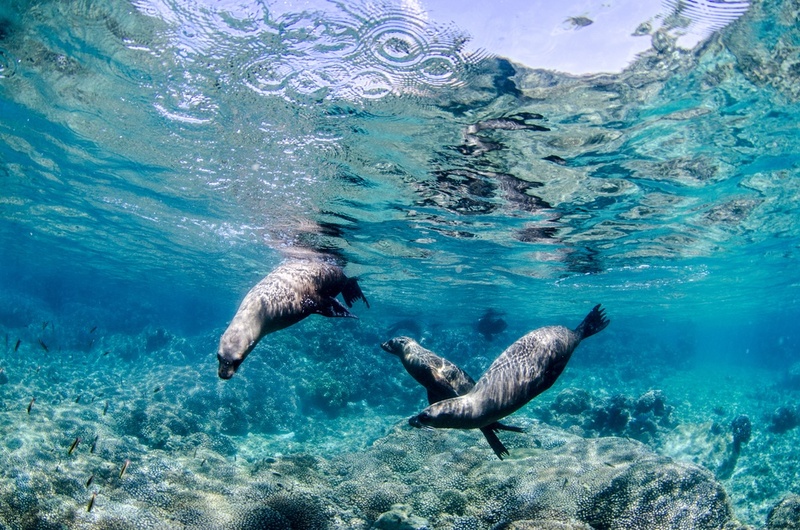 A large sea lion colony lives in the waters off the island, and you can can snorkel with them most months of the year, though not in the mating season during July and August. Espiritu Santo offers wonderful opportunities for hiking, camping, glamping, kayaking and Stand Up Paddleboarding. Do not miss Ensenada Grande Beach. Tecolote Beach - Located in the northern tip of La Paz’s peninsula, Tecolote Beach is the perfect place for an authentic Mexican beach experience. The beach has a few restaurants serving spectacular grilled snapper and plenty of palapas for shade. It is a relatively uncrowded spot with crystal clear waters. Jet skis are available to rent, among other activities. 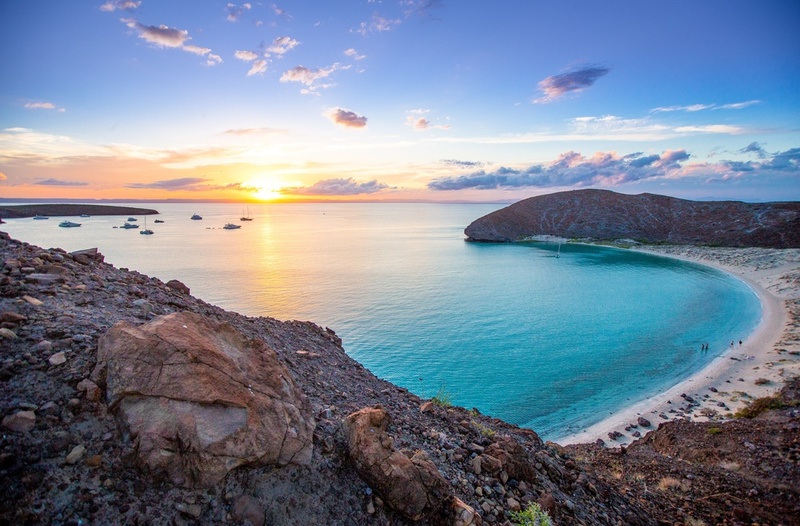 From here, you can also see Espiritu Santo island, adding to the charm. Baladra Beach - An uncrowded and beautiful beach with calm, clear waters, perfect for relaxing and watching the sunset. The beach is full of picturesque rock formations and is an ideal place for kayaking. It has a small snack stand and a number of palapas for shade. Nearby, you can also hike or swim to a few other top-notch beaches for an even more exclusive and secluded beach experience. La Paz is a great place to connect with nature and the ocean, and features a variety of different activities and sports. Some of the most highly recommended experiences include kayak rentals and tours, stand up paddleboarding, boat tours, snorkeling, swimming with whale sharks, and humpback whale-watching. Hotel Catedral(mid-range) - Found in La Paz’s historical city center, Hotel Catedral is near many of the city’s top landmarks. Travelers will enjoy its comfortable facilities, contemporary decor, and excellent customer service, not to mention its delicious on-site restaurant. Camp Cecil (Isla Espiritu Santo glamping) - Camp in style in these spacious beachfront tents on the shore. Enjoy comfortable safari-style tents with full beds, cozy linens, and the simple comforts of home. Nomada Organics & Gourmet ($) - Fresh, healthy, and organic! Vegan friendly. The little town of Todos Santos lies just a 1h20 drive from La Paz, and is characterized by its rustic granite streets and multi-colored buildings with green cacti, boasting a spectacular setting along the coast in a beautiful oasis. It is set deep in the desert with a mesmerizing view of the Pacific Ocean. Appreciate the dazzling galleries and works of art throughout the town, and the many different cultural festivals and events that take place throughout the year. Taste fine creative flavors and cuisine in this “Magical Town”, and take your time to mingle with the many artists, surfers, and intellectuals that come to Todos Santos for it’s unbeatable climate. This is a place to rest, relax and enjoy. Playa Los Cerritos - This beach is amazing for surfing big waves. Surfboard rentals are available on the beach. It’s also a nice place to relax in the sun with a refreshing beverage in hand. Palm Beach - This remote beach is very off the beaten path and is somewhat difficult to access. The road to the beach is full of beautiful cacti and palm trees. On this secluded strip, there are no facilities, and you may be the only soul there. Playa La Cachora - This is another great surfing beach with strong waves and lovely sand. There are plenty of nice amenities and cheap massages on the beach. Sometimes, you can even see whales when you look out into the sea. Punta Lobos - This is one of the main beaches where local fishermen set out from. It is a great place to buy the freshest fish when they return around 3pm. Sit back and appreciate the traditions of old Mexico. Tortugueros Las Playitas welcomes visitor participation in Sea Turtle conservation activities all year long. 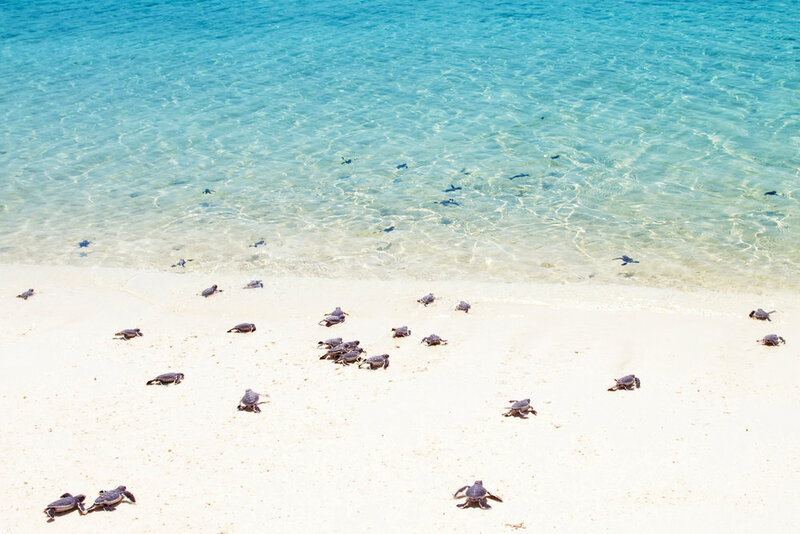 The program includes Sea Turtle habitat protection, hatchling release, nest rescue and incubation, environmental education and community outreach. There are volunteer opportunities for all ages. This is a magical experience. La Bohemia(barefoot luxe) - This inviting hotel may be small, but it has major character. Authentic Mexican design melds with white-washed walls, and the leafy green outdoor spaces seamlessly transition into cozy interior rooms. A house bar and shops, galleries, and restaurants just steps away make La Bohemia a wonderful place to rest your head at night. Wrap up your unforgettable journey with a final 1h drive back to Cabo San Lucas, immersing yourself in the enchanting roadside landscapes one last time. With so much to see, do, and experience, Baja California Sur is a must for any adventure traveler, and road-tripping through this enticing region is sure to make it even more thrilling.